Clumsy Knot is the first album to be released this year on one of Scotland’s newest micro-labels, Lost Map Records. However, already boasting the likes of Kid Canaveral, Monoganon and The Pictish Trail, Lost Map are sure to bring a copious amount of exciting releases throughout 2014. This is the first full-length album release for Randolph’s Leap and opening song ‘Unnatural’ delivers an infectious chorus that is reminiscent of King Creosote. Lead singer and songwriter, Adam Ross really brings the listener in to a lonely world in songs like ‘Cold’ but always gives that humourous touch throughout the album. ‘Foolishness Of Youth’ is a showcase of this humour and a standout track as Ross sings reflectively “If I spoke in Dutch would that help much?” using his technical singing style to great efficiency. The full band that occasionally aid Ross live and on record bring in an emphatic amount of incredible melodies through the keyboards, trumpet, trombone and guitars which are brought to light in ‘News’ and ‘Hermit’. Another highlight song ‘Light Of The Moon’ brings in the use of drum loops to bring a sense of electronica to what is mainly an indie folk pop outfit. This gives the only hint that over half the tracks are in fact home-recordings by Ross. Closing track ‘I Can’t Dance To This Music Anymore’ gains momentum throughout and Ross’ lyrics shine through again with a Scottish touch, “Cross-my –loof and hope to die”. 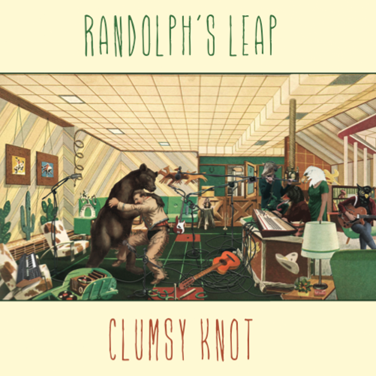 This debut album from Randolph’s Leap is creative, intent and purposeful which could see Ross step up onto big stages solo or with the band after release. With the album launch being held at the Kinning Park Complex in Glasgow on April 5 this is one gig for Glaswegians not to miss, with the energy in every track sure to be loose.